Essential to any visit to Venice, a gondola allows you to admire the city from the only surprising and original point of view. Starting from san Moise, near the hotel Bauer, to take you into the art and history of Venice, from Grand Canal with its magnificent palaces to the discreet charm of the smaller canals. You can admire some of the most important places that keeps Venice, from the famous Rialto Bridge, the elegant palace Papadopoli, from the house of Mozart at the Teatro la Fenice, from Punta della Dogana to the majestic Santa Maria della Salute. Want to make your gondola ride unforgettable. You can do this giving you the right musical accompaniment. 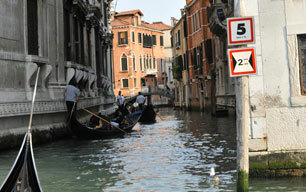 Your special with musical accompaniment provides for the mentoring of at most 2-3 gondolas on the Grand Canal.